Here is a copy of Pastor Chris’ Blog regarding our new DREAM CENTER. 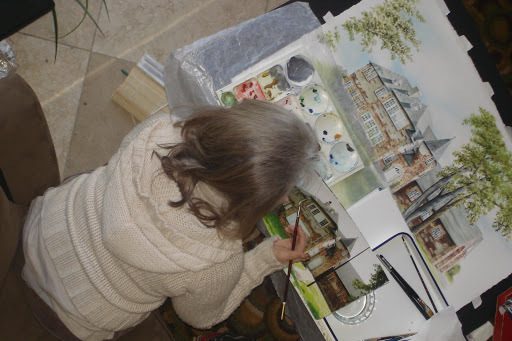 Photos of Peggy show her final touches during a recent meeting as well as the final rendering. We are so proud of our “award winning” artist who also just recently was selected to be in a national Pastel publication! A few months ago Church of the Highlands was able to purchase two buildings on the same piece of property in the Woodlawn area of Birmingham – a 17,000 sq. ft. clinic currently being used by the Jefferson County Health Department (which they are vacating this month) and an old abandoned fire station (seen below). Both buildings are currently undergoing some renovations and will open in the early part of Spring 2009. The medical clinic will be used by Christ Health Center to provide Christ-centered medical care to the area. The fire station will become The Birmingham Dream Center. The Dream Center will house the offices of the Church of the Highlands Outreach staff and become the staging ground for all of our outreach efforts to the city. Our dream is to bring light to the darkness and hope to the hopeless. With our facilities located in the heart of Birmingham, we will have a hand-on approach towards serving the poor and disenfranchised who live in the area. Whether we are delivering groceries to families in need or mentoring kids after school, our driving force is to remind people that God loves them right where they’re at. As we reach out to those living in addiction, prostitution and other desperate situations, we will see the power of God move on their hearts and in their lives. This Sunday we will receive a special “Passion Offering” over and above our regular tithes and offerings. • Planting 50 new churches in 2009 with the ARC. • Special missions efforts in the darkest places on earth. We’re encouraging everyone to pray and ask God what He would have you to do. Then plan – get together with your family or your own budget and decide what you will do. And finally participate – everyone do something and together let’s make a difference.